Researchers have identified eight, massive sheets of ice just below the Martian surface, and they appear to be relatively young deposits. Scientists just uncovered eight, massive ice sheets on Mars hidden below the surface. A co-author of a paper published Jan. 11 in the journal Science noted that future explorers can probably use the ice as a source of water, given the ice is only one to two meters (3.3 to 6.5 feet) below the surface. "Astronauts could essentially just go there with a bucket and a shovel and get all the water they need," study co-author Shane Byrne of the University of Arizona Lunar and Planetary Laboratory said in a statement. NASA has said that future Mars-exploring astronauts could use ice deposits close to the surface. In 2016, for example, a separate science team uncovered a deposit of water in Mars' Utopia Planitia that has the equivalent volume of Lake Superior. In a NASA press release at the time, co-author Jack Holt of the University of Texas stated that the Utopia deposit is at a mid-northern latitude and in a smooth area, making it highly accessible for future landing missions. The eight newly found zones of ice also appear to be vast. Lead study author Colin Dundas, a research geologist with the United States Geological Service, told Seeker that early observations indicate some of these sheets are at least 100 meters (330 feet) thick. Like the Utopia find, these eight zones are located in the mid-latitudes of Mars. They likely were deposited there as snowfall. And the deposits are just a few examples of subsurface ice on the Red Planet; the Science paper notes that one-third of the Martian surface has subsurface ice of some sort. While Dundas said the scientists can't pin down an exact age of the new ice deposits, in geological terms they appear young. There are few impact craters on the surface; in general, the older a surface is on Mars, the more cratered it appears. "These steep banks or slopes, which are known as scarps, currently only change very slowly from year to year, retreating by a few millimeters and getting a bit dustier in the summer." But in the distant past, Mars had warmer periods — making it difficult to estimate when the ice was deposited. Like on Earth, a Martian glacier is useful as a record of past climate change. "That kind of cross-sectional information is valuable for history," Dundas said. But the scientists cautioned that more observations are needed to learn about the layers, purity, and thickness of these ice deposits — which could show things such as the composition of the ancient atmosphere. The authors raised the possibility of ancient habitability in their paper, but that remains a contentious topic for Martian exploration. Water used to flow freely on Mars. But billions of years ago, the water appeared to stop flowing on most of the planet, lessening the chances for life. Scientists usually say Mars must have had a thicker atmosphere in the past that was lost to space; NASA's MAVEN (Mars Atmosphere and Volatile Evolution) spacecraft is at the Red Planet looking at atmospheric loss. Its data was recently used to extrapolate habitability for planets orbiting red dwarf stars. Scientists continue to search for ancient habitability on Mars. In 2020, both the NASA Mars 2020 rover and the ExoMars rover will set out for the Red Planet in search of signs of ancient life. But current habitability conditions are debatable. 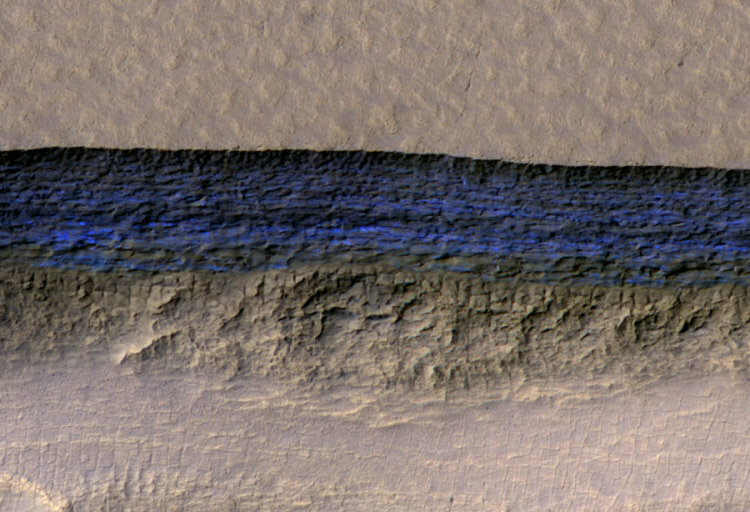 Scientists can't agree on whether Martian features called recurring slope lineae (RSL) are briny water — or not. 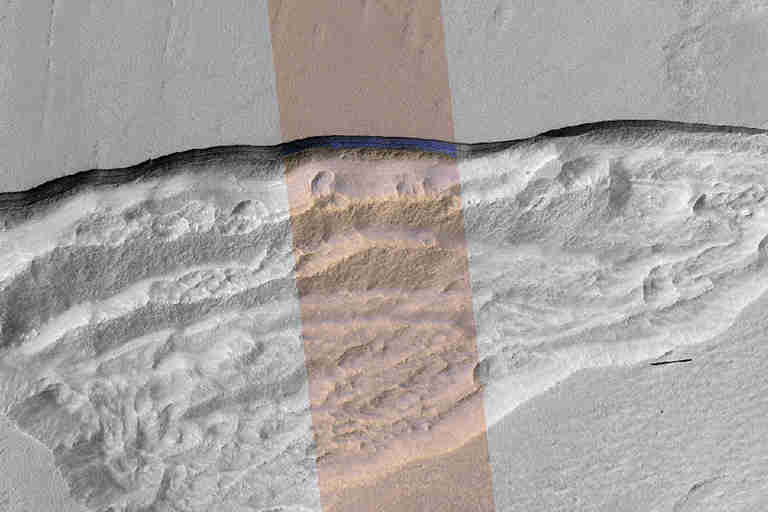 RSL appear as dark streaks on certain Martian slopes, and appear to change with the seasons. In 2015, a NASA-backed study announced that RSL is likely based on Martian surface water. Subsequent studies, however, argue that RSL may be due to dust, atmospheric water, or some other explanation. Dundas's team first spotted some of the new ice deposits a few years ago in images from the Mars Reconnaissance Orbiter. The new data comes after follow-up work with the NASA spacecraft, which has been at the Red Planet since 2006. The team used the High-Resolution Imaging Science Experiment (HiRISE) camera to look at the deposits up close in visual wavelengths. They also used MRO's shallow radar (SHARAD) to see how deep the deposits go, and the spacecraft's Compact Reconnaissance Imaging Spectrometer for Mars (CRISM) to see how the deposits change over a few years.